I’ve been sitting gazing blankly at the computer screen for a while. Not writer’s block – I’ve got plenty of blog posts planned out – but farmer’s exhaustion! It’s been quite a week. Now that we’re finally thawing out, we’re catching up with outside jobs. 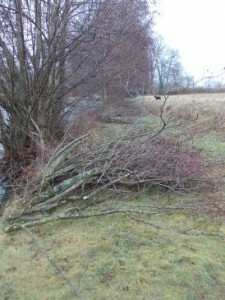 But there was still thick enough ice on the lakes till Wednesday to allow us to carry on chopping off overhanging branches and lugging them to the banks. This job would have taken several weeks if we’d had to do it from the bank in unfrozen conditions. As it was we got it done in less than half that time. OK, we still have to drag many of the branches into organised piles for either further sawing to turn them into winter fuel logs, or for burning in a bonfire if they’re too thin and wimpy. But we have the holidays to get that done in. After eight long weeks of term through the worst part of the year, at long last schools in Zone B have their winter holidays. Not that many people seem to flock to the ski slopes from Creuse. It’s more of a stay at home vacation here. And anyway, I think everyone’s had enough snow and ice for one winter! We’ve finished one of the raised beds in the polytunnel. That involved a lot of compost digging to fill it, but fortunately we have a lot of compost! And finally a proper working wheelbarrow for transporting it around in. My old birthday brouette (wheelbarrow), from two or three years ago now, was a two-wheeler which never worked very well. It was very unstable. Or perhaps that was just me. The hi-tech rubber stoppers on the end of the axles which held the wheels on kept getting knocked off and so the wheels would quickly follow suit. It led to much swearing. Now I have an early, and I emphasise early (six months in fact) fiftieth birthday wheelbarrow. It’s 90 litres and enormous. Sadly a bit of it is missing. Chris got it from Bricodepot in Montluçon which is notorious for selling incomplete kits of things. Chris double and triple checked during the buying process, and even asked the sales assistant, to make sure he’d got all the right wheelbarrow bits. But one was missing when we got home, the renforcer for the caisse (supporter bit for the barrowy bit). It’s usable but could soon get rickety. We finished the week with some fencing reconstruction and reniforcement. We’ve been carting fence posts into place which Chris has then whacked into position. Then we’ve battled with barbed wire and against brambles to make a llama-proof fence. Should be done tomorrow so Denis can get back out in his field again. And now the ice is melting we can give our poor hungry carp a daily dose of carp pellets again to keep them nice and fat for the fishing season. All those jobs are on top of the usual maintenance and livestock chores, plus some extra plumbing Chris is having to do post-burst-pipes, and added to our 10 kms of walking each day to get Rors to and from his school bus. No wonder I’m a bit slow this afternoon! But cheery, energising things are happening. The crocuses are coming out, the daffodils are hanging on (they took a bashing from le grand froid), the grues are migrating northwards – spring isn’t too far away. The two remaining chickens look like they’re thinking about laying again, and the sheep we hope are seriously contemplating imminent motherhood too. And we have our pigs lined up now. 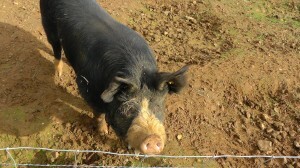 When I last mentioned them the other day, piglessness was looming. We were having problems finding any. No longer. A breeding trio of Berkshires will be joining us in early May. Which is great news, but will mean a major pig fencing programme.